Authors is the perfect app to keep up with hundreds of best selling and other great authors with real-time updates from Twitter, Facebook and all of their online life right at your fingertips. Personalize the app to have just the ones you select and use it to discover new ones too. Author video interviews are also just a click away. All of the authors' books are right in the app as well. 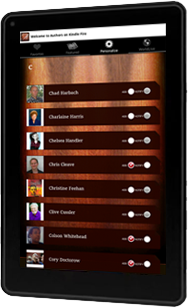 Download now and get closer to your favorite authors. © Copyright 2018 WorldLive Mobile, Inc. All rights reserved.